Claude Debussy (1862–1918) was already suffering with the cancer which prematurely ended his life, when he began to compose his Violin Sonata in G minor, L140. He began to sketch the work in 1916 and completed it the following year. It was to be his final composition and was in fact part of a projected cycle of six sonatas for various instruments, of which only three were written (the others being for Cello and the ravishing Sonata for Flute, Viola and Harp). Its three short movements provide an astonishing range of moods and emotions within a relatively short time span and, according to a typically self-deprecating remark by the composer, it represents ‘an example of what may be produced by a sick man in time of war’. 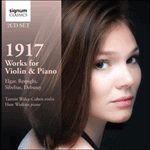 Debussy was profoundly affected by the war. In particular, he wished to assert a strong sense of nationalism in his music, that bordered on a definite anti-German feeling and even signed the score ‘Claude Debussy—musicien français’. There is a profound air of melancholic nostalgia that imbues this music, and the whole work is intricately and subtly linked within its thematic scheme. There is also a definite Hungarian flavour to the writing, irrespective of Debussy’s aim to be resolutely French. In 1910, he had met a gypsy violinist in Budapest and been fascinated by his flamboyant style of playing. This may have subconsciously coloured the style and mood of parts of the sonata, especially the Finale. Debussy composed this last movement first and it references material in the two preceding movements. The opening Allegro vivo is deeply felt with its typical theme of falling 3rds supported by ravishing harmony, while the middle movement Intermède: Fantasque et léger, seeks to dispel the sombre mood, being unusually bright and capricious. While the finale (marked Très animé) undoubtedly returns to the earlier mood, it nevertheless builds to an ecstatic conclusion, which sounds a surprising and definite mood of optimism, in spite of Debussy’s own tragic circumstances. The premiere took place on May 5th 1917 with soloist Gaston Poulet accompanied by Debussy himself. It was to be his final public performance and he died on March 25th the following year, at the age of 58.